Our Orka Valley project and property for sale in Fethiye is located in the Ovacik valley and just a 5 minute walk to the main Ovacik road or a 15 minute walk to the Orka Hotel. Due to its ideal location, spectacular panoramic mountainous views of Babadag and Mendos mountains can be enjoyed. There are 19 detached villas in total on this complex 12 of which will have their own private swimming pools, and 7 of which will share a large communal swimming pool. Each villa has an open plan ground floor with a large lounge, kitchen and dining area. There are patio windows overlooking the swimming pool and gardens. There is also a downstairs W/C. The bedrooms are located on the upper floors and an atrium viewing area is created from the staircase allowing maximum light to flow through the property. Each bedroom has en-suite facilities and balcony. 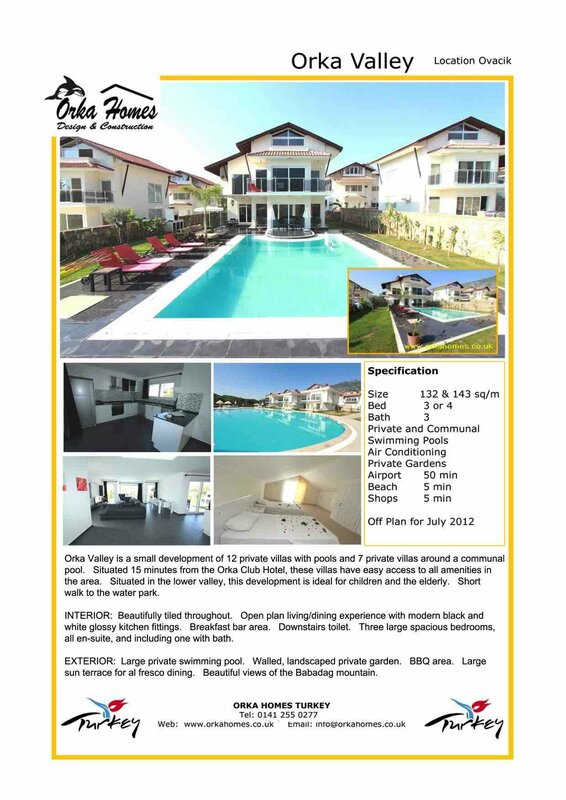 These villas are close to a variety of amenities and will prove to be very popular on the rental market. These are the perfect property for sale in Fethiye whether it be for residential living or just for the holiday villa rental market.